The Observation of Atomic Collisions in Crystalline Solids presents a critical account of the more important experiments which have provided the basis for a better understanding of atomic collision phenomena in crystalline solids. Collisions have been divided into two artificial regimes; primary collisions which deal with the interaction of the incident particles with the solid, and secondary collisions which deal with those events which occur as a result of lattice atoms recoiling from primary encounters. Although the book is intended principally for the experimentalist some simple theoretical models have been introduced. 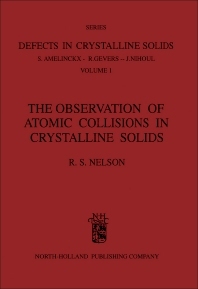 It is hoped that the book will provide a useful introduction to the subject of atomic collisions in solids for the post-graduate research student, as well as providing a collection of the most important experimental data for established scientists actively engaged in the field. It is also intended to provide a background for the technologist engaged in such fields as the ion implantation doping of semiconductors.